Although starting at a relatively lower elevation and lacking the monster climbs of other stages, stage 1 has proven to be one of the toughest stages over the years since it is often quite hot and dry. 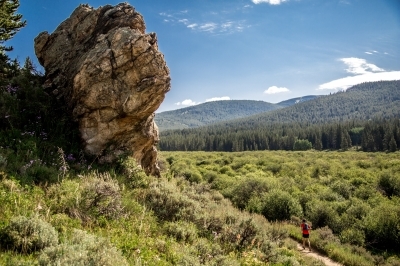 The running surface varies from gravel and rock to sand on a mix of trails, four-wheel drive roads and Forest Service Roads. 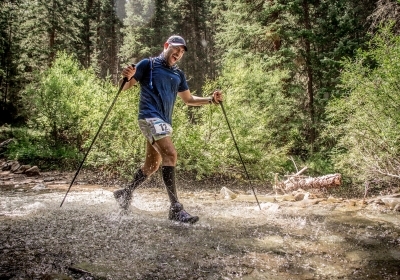 You may want to invest in a pair of gaiters for your shoes. From the start, you climb steadily to the high point at Checkpoint 1, and from there it’s mostly downhill to Checkpoint 2. Be ready for the last 4 miles, which is a grueling false flat on County Road into the finish at Railroad Bridge. Starting from Vicksburg, not far from the turnaround of the Leadville Trail 100, you will start climbing gently on gravel Forest Service Road. 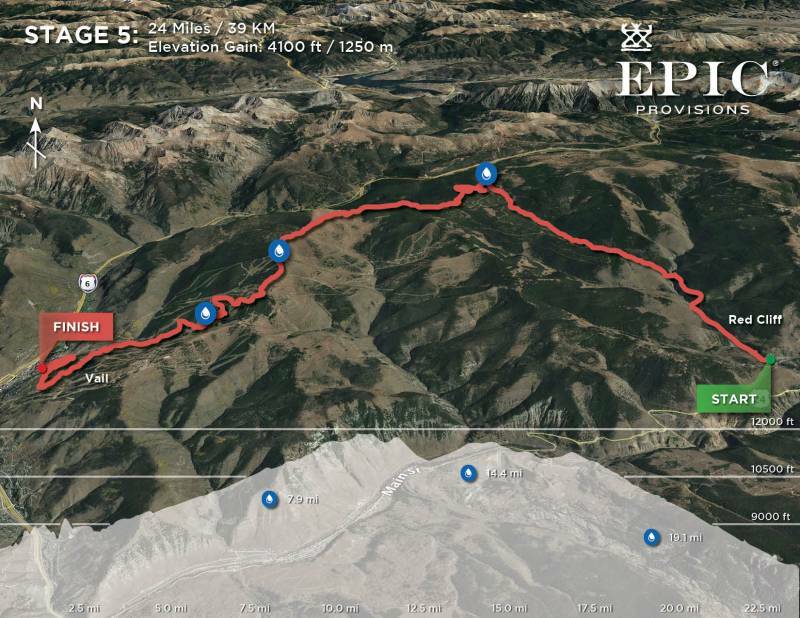 The first Checkpoint is at only 1.7 miles at the Sheep Gulch Trailhead, where you will enter the singletrack and start climbing steeply for about 2.5 miles to the summit of Hope Pass at over 12,500 feet. After this outstanding photo opportunity, you will descend toward Twin Lakes. The trail is steep and technical until the aid station at 5.3 miles, and then descends more gradually down to the altitude of the lakeshore at about 9,200 feet. From there it is a beautiful rolling singletrack trail on the south shore of the lake and through the historic village of Interlaken. The last few minutes are on a dirt road to the finish. Remember to bring enough water for the entire stage, since supplies are limited at Checkpoint 2. Our longest stage, stage 3, has moderate elevation gain, with the largest climb out of the way early in the stage. 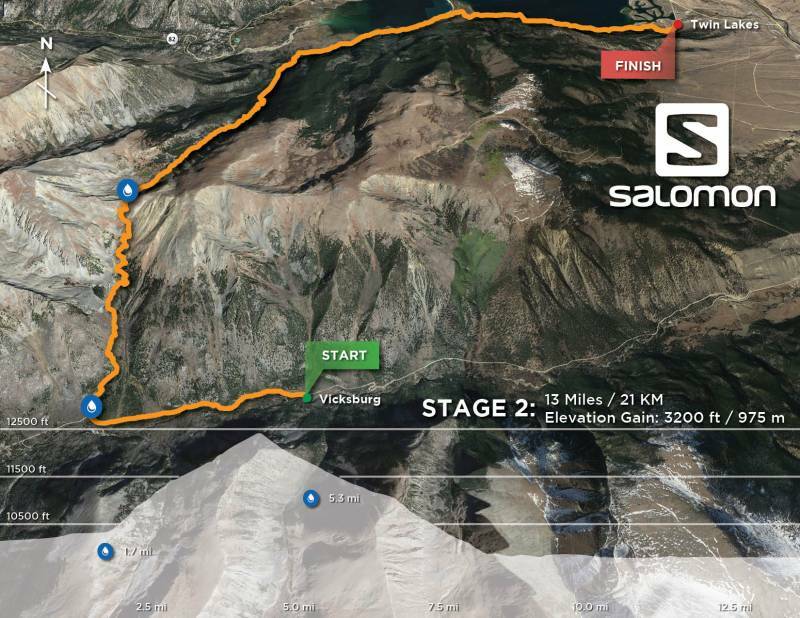 After 2.5 miles on the pavement out of downtown Leadville you will climb steeply on four-wheel drive road to the summit of the first climb. Descend again on double track into the first checkpoint. A more gradual climb on doubletrack takes you onto Ski Cooper, where you descend to Checkpoint 2 in the ski area (Ski Cooper) parking lot. You will cross the highway at Tennessee Pass onto the Continental Divide. From there you can look forward to a long rolling descent. You will be running on the Continental Divide National Scenic Traill into Camp Hale. Once you hit the gravel flats in Camp Hale you have about three miles of gravel ahead of you, which will test your mental toughness. You finish at Nova Guides, where the camp is waiting. 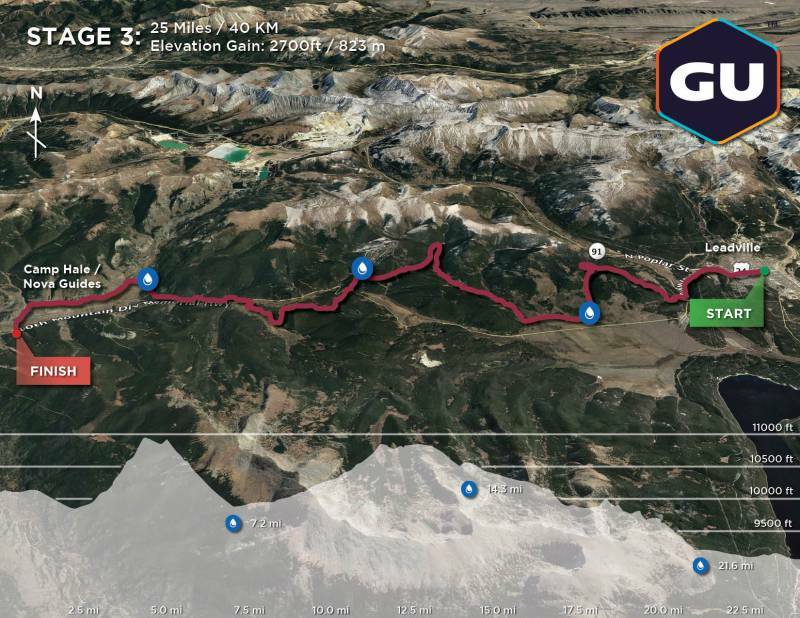 Like Stage 2, stage 4 is short and steep, although it tops out a little lower, at 11,700 feet. Starting with a rolling run on gravel roads for about 2 miles, you will then start climbing on a jeep road, which gradually gets steeper as you work your way up Hornsilver Mountain. Once on top, you are treated to an extended run on the rolling meadows along the ridge with views of Mount of the Holy Cross before starting the descent into the Wearyman Creek drainage. Watch for loose footing on the way down, as this stage has claimed a few ankles and bloodied a few knees. Once you turn left at Wearyman Creek, the creek is running down the middle of the trail. There is no way to avoid getting wet, as this water section goes on for about half a mile. The water is never more than knee deep and is cold, which is refreshing for hot feet. After Checkpoint 2 you will spend the last 2 miles running on a hard packed road to the finish in front ofworld-famous Mangos. Remember to bring cash or card for some fish tacos and margaritas on the patio. From Red Cliff you start with almost 8 miles on dirt road climbing moderately to Checkpoint 1. From there you will enter singletrack through the forest with several steep climbs and descents until you come to the open meadows on the back of Vail Ski Resort. Once on the ski resort, you will traverse the long ridge mostly on road and double track, but with one technical descent where the trail drops through a cliff band. 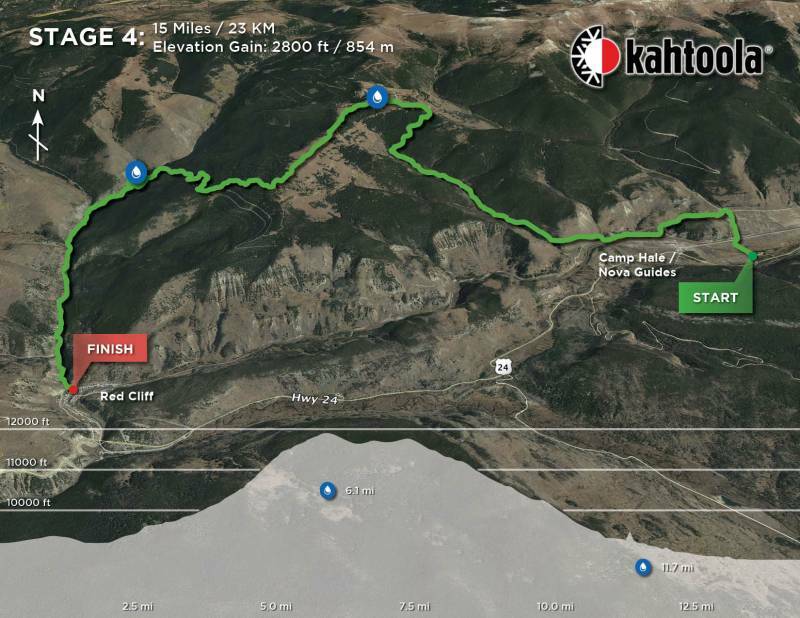 After leaving checkpoint 2 you will continue on the ridgeline for a few miles before dropping on to the front of the ski hill, descending towards Vail on a mix of access roads and singletrack. Pay close attention to marking as there are many intersections and trails on the resort. Descend to the finish at the Vail Athletic Fields. 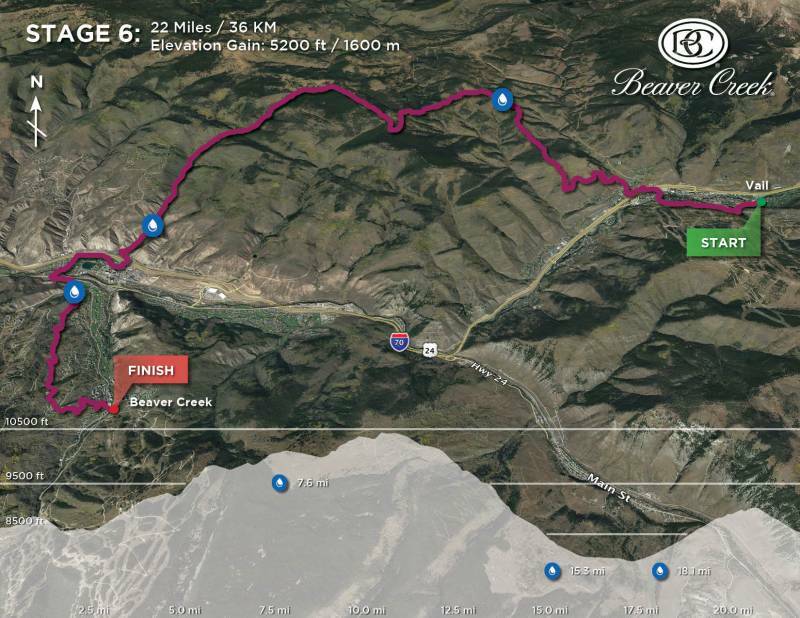 Stage 6 features a route from Vail to Beaver Creek with 5,250 feet of elevation gain. 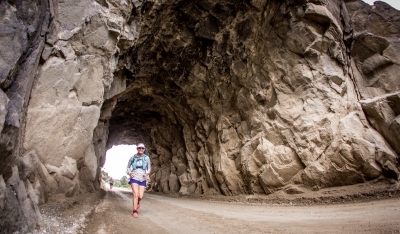 This route runs from the start in Vail Village on pavement, uses an overpass to cross the Interstate, and shortly enters the singletrack of Vail’s North Trail. From there, it’s a steady climb up the Buffehr Creek Trail and Red and White Mountain. Then a long descent down the shaded Buck Creek will bring runners into the town of Avon before the final climb into Beaver Creek, and a short downhill to the ultimate finish line. The legendary Stage kicks off at the Park Hyatt at 6:00pm. The nightly awards and presentation wraps up at 9:00pm. We then head to Coyotes which is in the Beaver Creek village. All of our routing has been recorded by GPS and thoroughly checked before the race, but mother nature sometimes has little surprises that mean last minute course changes. Don’t be surprised if there are small changes to the routing or stats before race day. Please note that all information is subject to change. Elevation gain/loss data collected by GPS can be highly inaccurate and varied depending on how it is measured and the equipment used. Our elevation data should approximate the measurements obtained by a portable GPS unit. 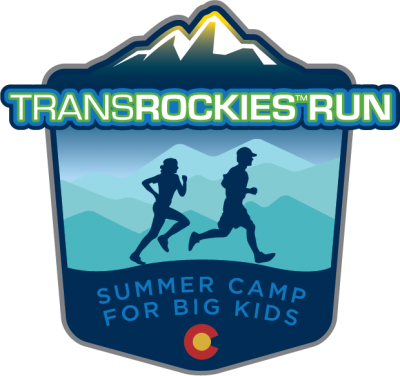 All camp locations will be passenger vehicle and truck accessible, although most will have no services beyond those provided by the organization. Driving directions for support crews will be provided with camping passes. With extensive experience in creating dynamic and challenging courses that run the gamut of mountain environments and conditions, the 2019 TransRockies Run organizers have once again designed a course that will, in every definition, leave you breathless. The route and stages listed below are offered as inspiration and a guide of what to expect. The actual route will remain secret until just before the event so that all competitors can maximize the adventure experience of entering something totally brand new. The following numbers are preliminary estimates and are also subject to final approval. In the event of extreme weather during the event and any subsequent re-routing, running surface types would also be subject to change. The route information provided below is subject to change pending final route planning and U.S. Forest Service permit approval.